Map showing location of Indiana on the US map. As you can see on the given location map of Indiana state US, Indiana is located in the Great Lakes Region of USA. However, the Indiana state US shares its boundary with Michigan in north, Ohio in the east, Kentucky in the south and south-east, and Illinois in the west. The Small portion of northern part of the Indiana US makes coastline with Lake Michigan; the coastline with Lake Michigan facilitates the state with see route. Indiana is the 19th state that admitted to the Union. The state has many cities with the population more than 100,000 along with several small industrial cities and towns. 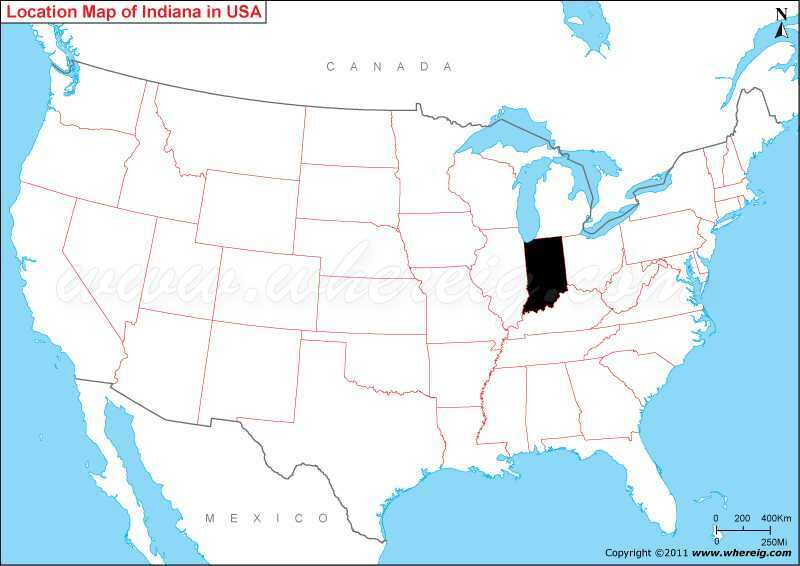 As you can see on the Indiana map US, the capital city of state is Indianapolis. It is the largest city of the state. The state is special in terms of sports; it is more popularly known as home of many important sports including NBA’s Indiana Pacers, NFL’s Indianapolis Colts, and the Indianapolis 500 motor-sports race (surprisingly, it is largest single-day sporting event in the entire world). The state has humid continental climate with some percentage of agriculture land. However, the state is also important for the tourists and education. The cities like Indianapolis, Evansville, Fort Wayne, South Bend, Gary and many others are very much significant for the tourists. The locations of these cities, you can find on the Indiana state map. This is detailed map of Indiana US that comprises wide range of information including major and small cities, railways, and highways. It is very much beneficial for tourists, students, teachers, and other people who are interested in knowing about Indiana state US.